EyelineHer: VIDEO: How to create totally waterproof eyebrows (if you don't have any of your own) — plus lashes! VIDEO: How to create totally waterproof eyebrows (if you don't have any of your own) — plus lashes! Don't get me wrong: I love my trusty everyday eyebrow technique of eyeshadow + brow pencil + sealer. If it suddenly starts raining, I'm certainly not going to panic my eyebrows are going to wash off. But for a while now, I've been looking for a way to create totally waterproof eyebrows: the kind that will withstand not just raindrops, but full-on underwater swimming. And I'm pleased to report I've found one! The key? 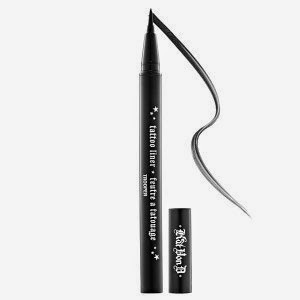 This nifty waterproof Tattoo Liner Pen by Kat Von D. It's a felt-tip in jet black, and once it's on it will not. Come. Off. (I mean, it does obviously, but it takes serious effort.) The nib is fine and pointy enough to be able to use it like you would a sharp pencil, and that's exactly how I use it. Tattoo Liner by Kat Von D, a.k.a. my newest love. This is exactly the same eyebrow technique as I've shown you in previous videos, in which I lightly feather individual "hairs" onto the brow area. (If you're unfamiliar with those, click here to take a look!) The only difference: instead of using a sharp eyebrow pencil to make these lines, I'm using this semi-permanent felt tip. It obviously creates a darker, stronger look, and it takes more concentration (because unlike using eyebrow pencil, it's a right hassle to correct any mistakes) -- but for getting beautifully waterproof brows that mean you can jump in a pool and look exactly the same when you jump out, it's so worth it. You can also use this pen like an eyeliner, so in place of my usual liquid liner, I use this to draw on a waterproof line where my upper lashes would be and to feather on little "lower lash hairs" to finish the look. Voila: pretty-much-totally-waterproof brows and eyeliner! I am losing my hair, they tell me due to thyroid problems, and your videos on how to tie a head scarf has helped me a lot. I also have very sparse eyebrows and eyelashes. Were I a younger woman -I am 58- I would try your brow and lashes techniques. Thank you so much for your blog and videos. Love your videos on YouTube. I have a blog, cancerwillnotbeatme.blogspot.com. I was diagnose a year ago with GBM (giloblastoma multforme stage 4). It is hard to feel good about yourself with cancer and cancer treatments. Do you mind if i refer to your YouTube channel for makeup tips. I do a blog post once a week about beauty tips. I would really appreciate it. Also, I'm new to blogging so if are willing a suggestion or two that would great. Thank you and keep fight. Yea that would be great. Thank you. Why not go for permanent makeup Or it have some disadvantages?